Review: One of the most inspiring and moving tales of the horrors of the Holocaust is revisited in the story of Peter, the boy who loved Anne Frank in the novel Annexed by Sharon Dogar. Sixteen year old Peter van Pels tells his story about life in the annex and death in the camps. His story is based on Anne Frank’s original words but is embellished to show what he might have believed and felt. Peter van Pels didn’t ask to live in the annex. He didn’t ask to be stuck with the annoying and often times obnoxious Anne Frank and her family, but because of his faith he had no choice. During a time when followers of the Jewish faith were taken from their homes and forced into German custody often times to be abused or murdered, the van Pels and Franks found refuge in an annex. To most, their life of confinement was infinitely better than the alternative, but for sixteen-year-old Peter, it was a nightmare. Peter is left in the annex heartbroken and dejected, questioning is faith and his very being. He watched his love be taken away and is haunted by dreams of her. But, whether it’s because they are two people with a need for someone to love or because it is destiny, Peter and Anne fall in love against all odds. But, the horrors invade before their love can truly blossom, and they are stripped of their clothes, their identity, and each other. Annexed is a story that leaves readers speechless. It is horrific, captivating, and suspenseful, but most of all it’s a story that must be told – over and over again for each new generation. “How can I tell of this?” I ask her in despair. Part of the story is told through Peter’s voice as he’s living through the annex, and part of the story is told from his view as he’s living his last days in the camps. The author uses differing fonts to help the reader. In the above quote, Peter is “talking” to Anne in his mind. He knows the end is near, but Anne’s voice, “I have so much to say, so many stories inside of me, Peter!” is forever resounding in his head. He knows he must tell his story, and Annexed is his story. He speaks to the reader, “Do you understand?” and the reader feels compelled to respond. Annexed enraptures the reader to the point where it becomes possible to truly believe Peter is right there telling the reader the story – compelling the reader to listen and to believe. The parallel stories are woven together beautifully. Peter’s life in the annex is filled with emotion, confusion and love while his life in the camps turns him into someone even he cannot recognize. 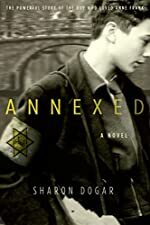 Having read a majority of the Holocaust novels for young adult, I can confidently say that Annexed deserves high recognition in the genre and should be recommended reading for all young adults. We would like to thank Houghton Mifflin Harcourt for providing a copy of Annexed for this review. Have you read Annexed? How would you rate it?